The Tazawako World Cup (Japan) is one of my very favorite stops on tour and I was ecstatic to have the opportunity to compete at such an awesome venue for the second time in my career. The course provides an exciting and subtle challenge — generally due to unique snow conditions (some of the athletes call it “wacky pack” due to its ever-changing stickiness) — the food is my absolute favorite (saying the sushi is incredible is an understatement), and the people are very welcoming and hospitable!! Most importantly, though, at this point, I was simply excited to ski and most of all, compete again. Despite cancelled training on day 1 of scheduled Official Training and a nearly cancelled day 2 due to weather, I was having a blast with the hour I did get to spend skiing the course! I eagerly embraced the first day of competition with a newfound excitement and infectious rigor and snagged the best result of my season (4th). Though I was merely 0.2 of a point away from a podium, I was incredibly happy with my consistent, top-notch performance that day! The second day was duals day and a mistake on my bottom air in a dual against 2018 Olympic Bronze medalist Yulia Galysheva cost me the opportunity to move on to further rounds of competition. I finished my day in 10th place. The competition day also marked the last World Cup event for Deborah Scanzio, a 31 year old, 4-time Olympian Swiss skier who has 125 World Cups Starts. Because the event was held at her home mountain (Airolo), when the event was finally cancelled, all of the ladies circled around the finish area and cheered for Debbie as she skied her last mogul run. Though I don’t know her too well, it was pretty neat to be a part of the end of her mogul skiing legacy! While Deborah’s last event was in Switzerland, a few more retirements took place at the World Cup Final event in Mègeve, France, including my teammate Mikaela. Mikaela is a 9 year veteran on the US Freestyle Ski Team, with 62 world cups starts, 2 podiums and 1 win! Though I will absolutely miss her presence on the World Cup Tour, she will undoubtedly pave the path she wants to walk as she enters the world beyond mogul skiing (as she has already begun to do)! As a result, this event was bittersweet experience. With that, my bittersweet World Cup season was over. Over the course of the year, I had some pretty big lows but also achieved several new personal bests that outweighed all of my previous performances. My favorite World Cup moment was my return to the tour in Tazawako, where I performed the best I had all season! I made my second superfinal of the year (and ever) at the event in Tazawako — a result that personally solidified the fact that I am one of the very top skiers in the world when I ski my best. As a whole, I am proud of how I’ve persevered through some tough situations and the strength I’ve discovered within myself as a result! Shortly after the Mègeve World Cup Finals, my teammates and I traveled to Waterville Valley, New Hampshire for the final event of the season at US Nationals. US Nationals is always a fun event to ski at, as I am able to reconnect with friends both at the regional and NorAm level and compete against them! Waterville Valley put together a fantastic course/venue for all of us to compete on — another fun course I immensely enjoyed skiing! On singles day, I qualified in 1st place after the first round, continuing on with my trend of consistent skiing I had achieved during this second half of the World Cup Tour. Though I picked up the pace in my second run (literally skiing a few seconds faster) and executing every aspect of my run to a higher degree, I wasn’t able to best two of my teammates and ended up finishing in 3rd for the day! On duals day, I skied against a few younger skiers and teammates before making it into the round of 4, where I unfortunately lost both of my duals, finishing up my day in 4th. To start off these next four years, though, I am beyond grateful to be able to say I am one of 7 athletes who have been nominated to the A Team. Because of my results this past competition season and my hard work over the past few years, my coaches have nominated me to this position on the US Team! This means that I will be funded for the upcoming season and that I will have World Cup starts for the first few World Cups!! Beyond skiing, I was also faced with making my college decision this spring. After resting at home for a few days, my mom and I embarked on a trip to the east coast to visit a few colleges that I had been accepted to. As some of you may know, I have decided to attend Columbia University for my undergraduate collegiate experience!! 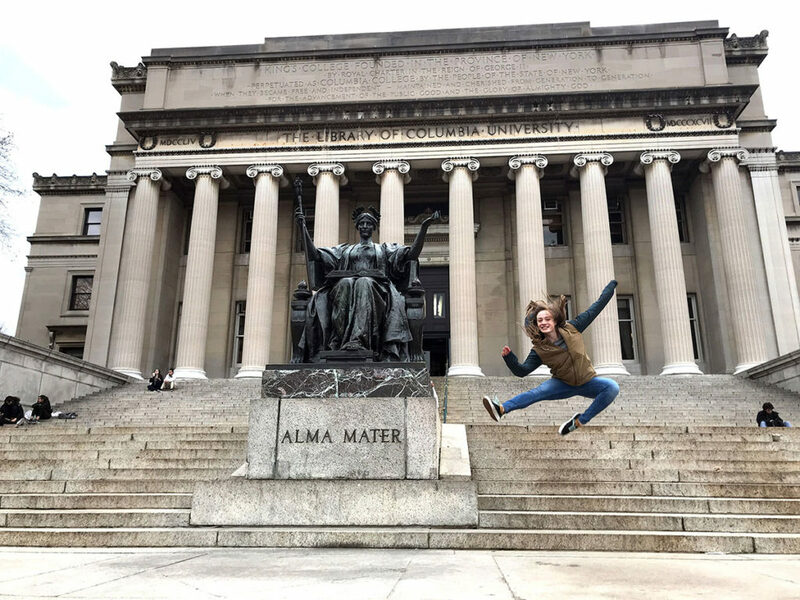 After spending a few days exploring the campus and attending the Columbia University admitted students event, the choice was obvious for me. When stepping onto the Columbia campus, I was astonished at the grandiosity of the university. I was in awe of the aura encompassing the students; it seemed as though — as my mom eloquently put it — each student had an unstoppable drive to “change the world.” This diverse, intelligent, competitive, supportive community of peers is exactly the group of people I want to be surrounded by during the upcoming years of my academic journey. Furthermore, New York City is an unparalleled location solely due to the fact that it offers an abundance of opportunities that cannot be found elsewhere. Simply stated, this is an amazing place to utilize as a jumping-off point for not only my academic life, but my career beyond college!! As you can tell, so much has happened during these past months — it’s quite tough to sum it all up in a few paragraphs! These next few weeks will be devoted to a ski camp in Squaw Valley, California, finishing up my high school education at Stanford Online High School, taking an AP exam, and bolstering my strength to be ready for the remainder of the prep season as I tackle the next steps in my ski career head-on!!! I am excited for you all to continue to be a part of my journey as I tackle the next four years (and beyond) in my ski career & in life! !